It turns out that planting the daffodils Mom so kindly sent me was like bringing coals to Newcastle. 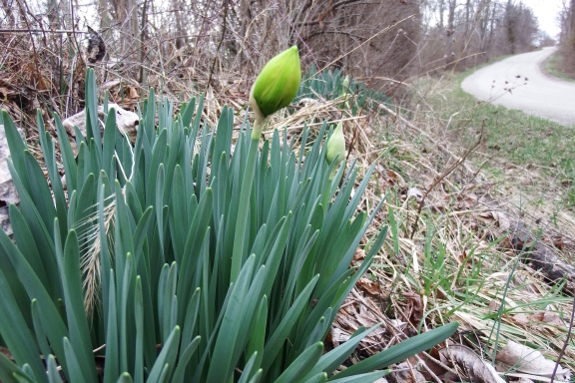 They did bloom a little earlier due to the two weeks they spent inside, but lots of pre-existing bulbs poked up their heads along the road soon thereafter. I believe it is called a yellow daffodil. The latin name might be the Yellowus Daffodilus! 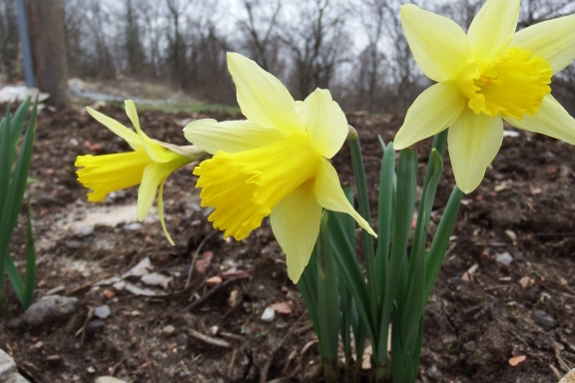 -Seems like lots of migrated daffodils along forest/grass zones in Ohio. How/why so many not sure but you'll probably see plently where no one would have planted bulbs in a given area? Maybe the flower dried head seeds are moved by birds. I'm assuming Jim was attempting to be facetious when he claimed the Latin name was "Yellowus Daffidilus". In fact, after looking at Wikipedia, it says "Narcissus /nɑːrˈsɪsəs/ is a genus of predominantly spring perennial plants in the Amaryllidaceae (amaryllis) family. Various common names including daffodil,[notes 1] daffadowndilly, narcissus, and jonquil are used to describe all or some members of the genus. Narcissus has conspicuous flowers with six petal-like tepals surmounted by a cup- or trumpet-shaped corona. The flowers are generally white or yellow (also orange or pink in garden varieties), with either uniform or contrasting colored tepals and corona." More than likely, the flowers the previous owner planted (or may not have planted but was "planted" there by squirrels and other critters) was the common daffodil. Do the flowers have a scent? If so, they might be heirloom plants. The modern hybrid ones seem to have lost their scent.